Amber, Jazz and Geena have finally secured their auntie's engagement to the gorgeous Mr Arora, but now it's time for a little romance of their own. There's a gorgeous new boy at school called Rocky. He looks divine, loves music and is seriously well-off - his parents have built him his own recording studio. But which of the sisters does he like best? As they vie for his attention, the sisters come up with ever more intricate tricks to outdo each other and catch his attention. Amber thinks she's bound to capture his heart when she invites him to DJ and perform at Auntie's wedding. 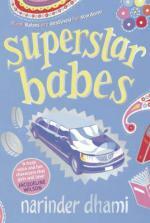 But when the girls are invited round to hear Rocky sing, Amber realises she's made a big mistake. It's going to be a huge headache to sort this one out - but if she doesn't, every guest at the wedding will have a worse one! Even working together, Amber, Jazz and Geena can't work out how to stop it happening, but a great idea comes from an unexpected source and the girls, of course, bounce back again.